Upcoming public performances at festivals and historic performance center and theater. Sat. Oct. 11 Taste of the Catskills Festival, Delhi, NY – Performances of TURTLE ISLAND MEDICINE SHOW at 1 & 3 pm. Rain date- Sun. Oct 12. Our appearance co-sponsored by the Catskill Watershed Corp. Sat. Dec. 6 Sinterklaas, Rhinebeck, NY – Performances of INTO THE LIGHT at 2, 3, & 4pm A dance/theater collaboration with the Vanaver Caravan. Sun. Dec. 7 Shadowland Theater, Ellenville, NY – Performances of INTO THE LIGHT at 2 & 5pm A dance/theater collaboration with the Vanaver Caravan. Co-sponsored by the Ellenville Public Library & Museum through a grant from Arts MidHudson. Check our Calendar of Events for updates and then come out and see a performance. We’re always looking for new opportunities to share our work. 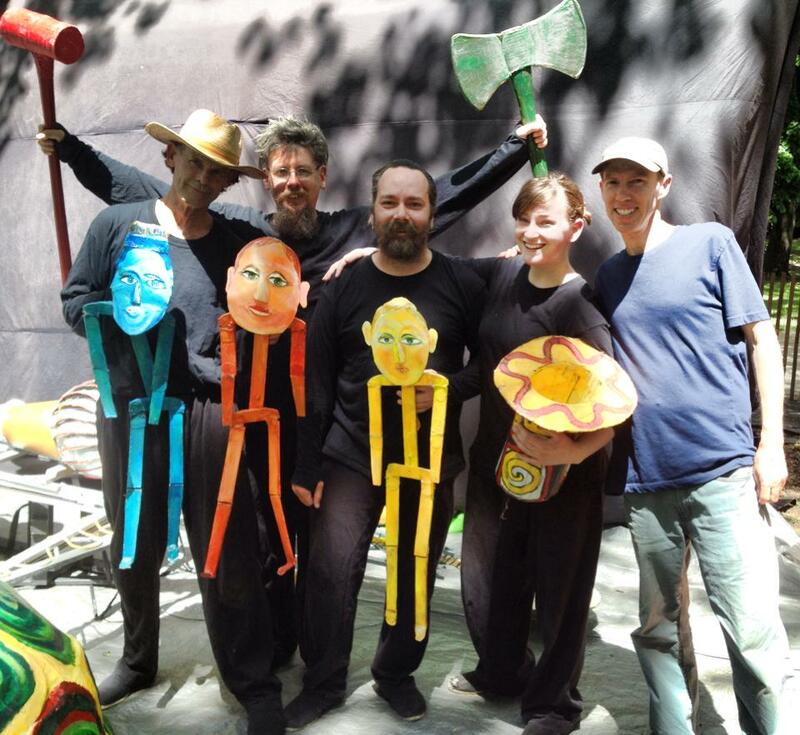 Contact us about bringing Arm-of-the-Sea Theater to your community. Lots of exciting news! New Esopus Creek space for Arm Of The Sea Theater, [unedited] Video, Annual Report, Artists-In-Residence, NEW website and our generous sponsors. Our 2014 Esopus Creek Puppet Suite materialized for several evenings last month. It was brought to life by twenty-five artists and volunteers, enjoyed by hundreds of audience members, and then vanished like a dream. You can, however, view Bart Friedman’s complete unedited video of the production and Jim Peppler’s photos. Check out our most recent Annual Report. And consider supporting our work through this secure online DONATION FORM via NY Charities. CITY THAT DRINKS THE MOUNTAIN SKY (STDTMS), the longest running show in our repertoire, portrays New York City’s water supply system in the Catskill Mountains. This fall we’ll be bringing CTDTMS to seven Catskill region schools, thanks to a grant from the Catskill Watershed Corporation. Participating schools include Roxbury Central School, Jewett Windham Ashland Central School, Margaretville Central School, Woodstock Primary School, Delhi Central School, Townsend Elementary in Walton, and Bennett Intermediate School in Boiceville. Hook, Line & Sinker: Fishing the Hudson River – A contemporary chronicle of fishing lore for community waterfront events. This project is part of the Hudson River Fish Advisory Outreach Program. Good Dirt – A puppet extravaganza exploring food, farming and the secret life of the soil. The Odyssey & Other Classics – A potpourri of famous tales for libraries and small venues. Our Artist-in-Residence Program will set up shop in three schools this fall: Seymour Smith School in Pine Plains, NY (October), King School in Stamford, CT (November), and Morse School in Poughkeepsie, NY (December). For those of you in the trenches of public education: We have received a multi-year grant from the NYS Council on the Arts that can underwrite up to 50% of the cost of a residency program. Contact us for further details. Construction is underway on a second floor within a large storage building adjacent to our Esopus Creek studio. This will provide an additional 1200 sq. ft. of clean, dry space for our ever-expanding menagerie of paper-mache’ characters. Most significantly, the space is above the reach of future flood waters. The project is made possible through a grant from the Hudson River Improvement Fund. Check out our new website designed and hosted by David Radovanovic of whatsthebigidea.com. It was compiled and launched over the summer after our former site was overtaken by vandal-bots. Full Schedule Of Performances – Thanks To Generous Supporters! Our 2014 performance season and education programs are made possible by the generous support of the Puffin Foundation, Hudson River Improvement Fund, Catskill Watershed Corp., Robert Rauschenberg Foundation, TD Charitable Foundation, Macy’s, Klock Kingston Foundation, Stewart’s Shops, Price Chopper’s Golub Foundation and the Hudson Valley Credit Union. And by public funds from the New York State Council on the Arts, with the support of Governor Andrew Cuomo and the New York State Legislature.